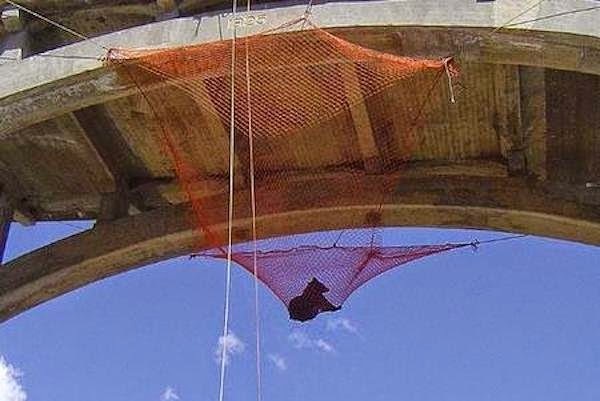 A Bear Got Trapped Under A Bridge With No Way To Escape. How They Saved His Life Is Brilliant. This wild animal rescue is one that you’ll have to see to believe! 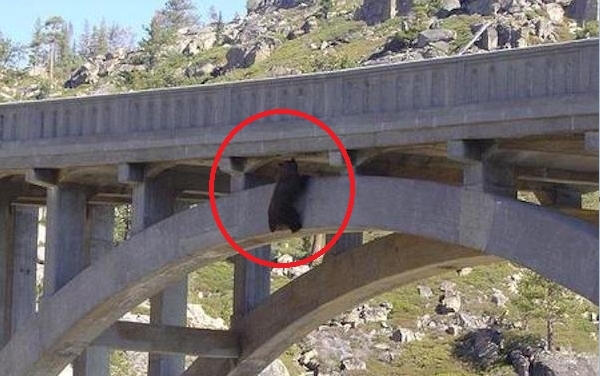 A bear was walking across a highway bridge in California when he got scared by traffic. He crawled over top of the concrete railing and got stuck under the bridge arc. With no way to climb back up or crawl down, the bear was stuck. And with a 100 foot drop to the rocks below, the bear’s life was in danger. Animal control arrived and were afraid that the bear was going to fall. They could see him making several attempts to crawl down the bridge! They knew they needed something special to rescue the bear. 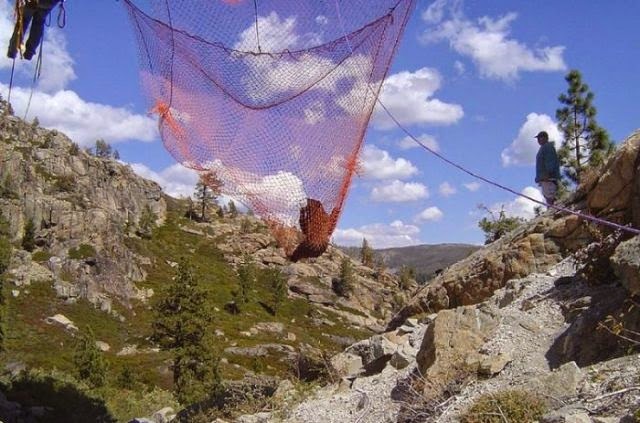 They went especially to Nevada and got a large nylon net. Several rock climbers and tree service employees joined in to help, bringing ropes and pulleys. 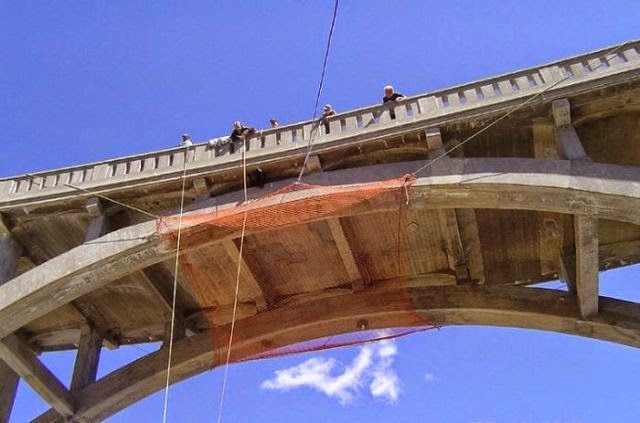 They positioned the net beneath the bridge and then tranquilized the bear. 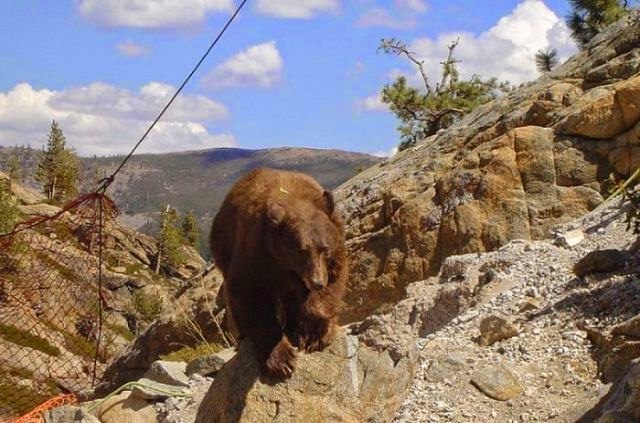 Shortly after, the bear fell unconscious and an officer lowered himself down to the bear and gently pushed the 250-pound bear into the net. About a dozen people pulled the bear back up to safety. They took him to a shaded area where he gradually woke up and headed back into the wilderness. 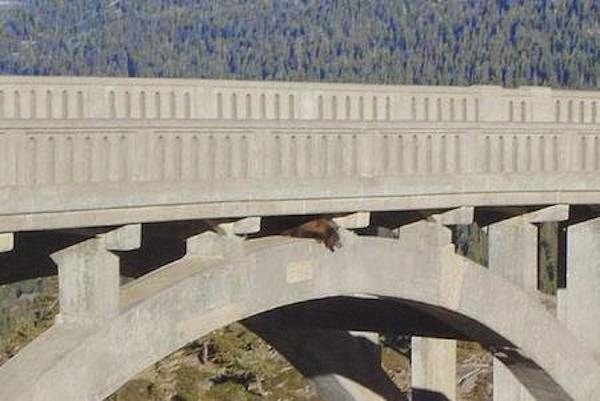 Responses to "A Daring Bear Rescue from a Bridge (6 pics)"
How the Hell did he get there? That is so great that so many people cared & came together to save the bear. Thank you all.. It is wonderful to see so many caring people join forces to save the "little" fella <3 Thank you to everyone of you folks for caring so much ! This is a wonderful story and brings on tears and the pictures make it so you witnessed the event.... Lovely outcome and thank you to all the kind responders! Thank you to all those with big hearts who helped this poor bear get to safety. Congratulations on a great job well done. How did the Bear get there? Certains les sauvent mais d'autres "sportifs"helas les abattent,par plaisir,!!! How did that bear get there? What a fantastic thing they did!